E-waste, or electronic waste, is a difficult environmental issue that’s both hazardous and unsightly. In the hands of UK-based artist Julie Alice Chappell, however, unattractive circuit board scraps are reborn into beautiful works of art. 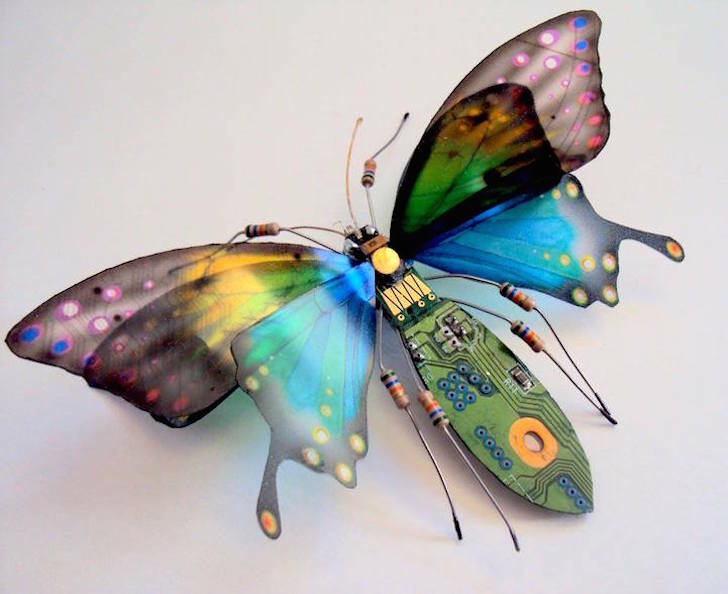 In her series ‘Computer Component Bugs,’ Chappell raises awareness of e-waste with her delicate insect sculptures made from upcycled electronic components. 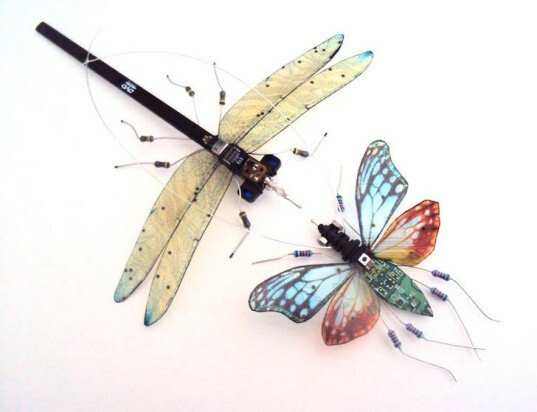 Chappell first began tinkering with the idea of making insect miniatures out of discarded electronics several years ago when she experimented with donated electronic scrap at “The Craft Bank,” a Portsmouth arts center that collects and distributes donated craft material. She took a few pieces home to make ant sculptures with her children. It wasn’t until years later, however, that she revisited the idea for an environmental art project that’s since expanded into an Etsy business. “The recycled bits of cultural refuse that are woven throughout my work represent a direct encounter with the excesses of modern living highlighting the dangers of planned obsolescence and e-waste in the environment,” Chappell said to My Modern Met. “The work displays an aesthetic beauty whilst offering a socio-political discourse, attempting to reclaim waste and the destruction of the natural world, in the beauty of visual art.” Chappell’s beautiful and colorful upcycled sculptures include a variety of insect types, from butterflies to cicadas. Her artwork is available for purchase on Etsy. Chappell first began tinkering with the idea of making insect miniatures out of discarded electronics several years ago when she experimented with donated electronic scrap at “The Craft Bank,” a Portsmouth arts center that collects and distributes donated craft material. She took a few pieces home from The Crafts Bank to make ant sculptures with her children. It wasn’t until years later, however, that she revisited the idea for an environmental art project that’s since expanded into an Etsy business. Chappell was also motivated by a nature program on bio-diversity. “The recycled bits of cultural refuse that are woven throughout my work represent a direct encounter with the excesses of modern living highlighting the dangers of planned obsolescence and e-waste in the environment,” Chappell said to My Modern Met. Chappell’s beautiful and colorful upcycled sculptures include a variety of insect types, from butterflies to cicadas. Her artwork is available for purchase on Etsy. Recycled circuit bugs by Julie Alice Chappell.